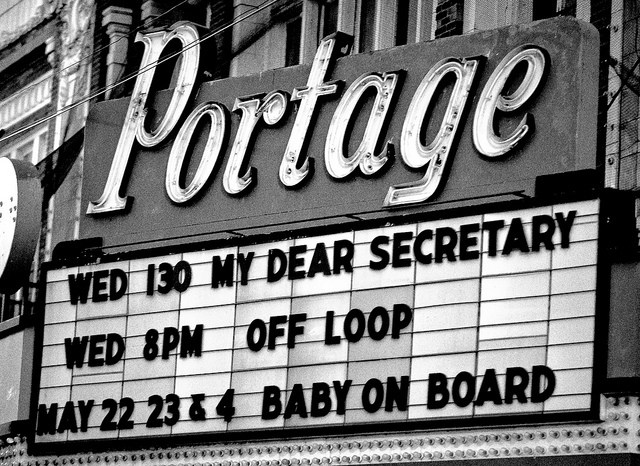 On Thursday, Alderman John Arena announced that the Landmark Commission had voted unanimously to allow preliminary landmark status to the Portage Theater. This was a blow for the Chicago Tabernacle, an Albany Park ministry that had plans to turn the Theater into a church. The Theater could still be sold, but the historic nature of its designs would potentially be protected. Speaking at The Paper Machete last week, Chicagoist&apos;s Steven Pate explains the value of the Portage, which he said had "become a kind-of movie nerd&apos;s paradise." Just wondering: have you been to a movie theater in the past 40 years? If so, would you like to revise that agenda? A popcorn and two Cokes will cost you more than a Metal Machine LP in very good plus-plus condition on eBay. You will endure a torturous info-tainment regimine, wherein Channing Tatum wll talk about what GI Joe means to him, and Sprite will convey to you access codes for downloading behind the scenes footage from a 3D Justin Bieber movie. Someone in the seat next to you will be playing Tiny Tower on their iPhone during the movie. Or, let&apos;s be real, telling everyone and Facebook that they&apos;re sitting next to you? Is this really an essential component of your perfect day? If not, is it the drugs talking?"